This image shows a thin plastic section (i.e., embedded in plastic rather than paraffin and sliced at 2µm thickness vs. 5-6 µm for routine sections) of the stomach mucosa. This preparation provides adequate resolution to see details of both parietal cells (P) and chief cells (C) as they appear in the deep portion of gastric glands. Secretory vesicles (containing pepsinogen) are clearly visible in the apical cytoplasm of chief cells. Within the cytoplasm of parietal cells, relatively lightly-stained regions suggest the presence of intracellular canaliculi (into which acid is pumped). 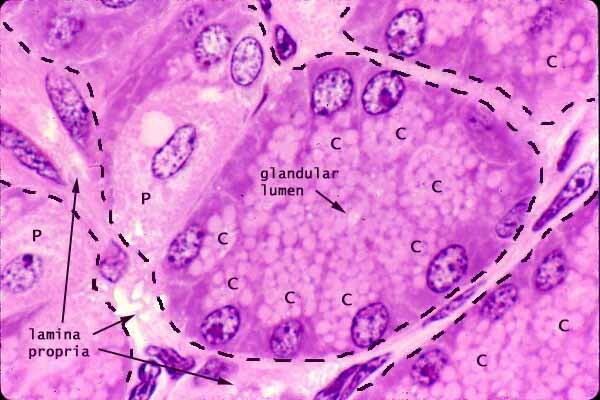 The epithelial nature of the chief cells can be readily seen in this section, which cuts across a gastric gland to reveal both the glandular lumen and also the surrounding lamina propria. The tubular gastric glands tend to be rather twisted deep in the mucosa, so that neat cross sections may occasionally be found even in sections perpendicular to the mucosal surface. More commonly, however, the plane of section passes tangentially or obliquely through the cells which comprise the wall of the gland. Thus, at low magnification, gastric glands often appear cord-like rather than tubular.